Digital world has opened a multitude of opportunities for brands to establish their presence and groom it through effective marketing techniques. It is incredibly important for companies providing mobile app development services to expand their reach in the web as well as mobile world to enjoy all the perks of digitization. Strategic implementation of white hat Search Engine Optimization (SEO) techniques is the thumb rule to get success in the World Wide Web world. These SEO strategies change with time as per revisions in the Google algorithm, latest trends and user’s online behavior. However, digital marketing strategy is incomplete without creating a mobile presence of your brand. The size of mobile audience, 2.53 billion users is too large to be ignored in this age of smartphone. Building a mobile app for businesses is no more an option, rather a necessity to survive in the highly competitive digital landscape. What Defines the Success of Mobile App? What is the most critical aspect of building a successful mobile app? If your answer is ‘development’ then I would say you are wrong, or may be partially right. Though development of Android or iOS app is undoubtedly an important element that defines its success, but getting recognition and desired visibility in the App Store is much more significant. To understand how competitive it is to get recognized in the mobile app marketplace, let’s take a look at the statistics. As per March 2017 Statista report, Google Play Store is the house to over 2.8 million Android apps and Apple App Store remains the second largest place containing 2.2 million iOS apps. With millions of apps already existing in the store, how would your app make an outstanding place there? How would your app be noticed in the crowd of millions? The real challenge for developers is to get your app surfaced higher than millions of other competitors in the app store search results. Apps that rise above this challenge and manage to reach out to the targeted user base are successful and deliver expected ROI. The mobile app ecosystem will complete 10 successful years in this summer of 2018. The mobile app marketplace has become of the biggest and fastest growing industries encapsulating millions of app developers and billions of app users. App store optimization is a marketing approach that prepares the app to face the cut-throat competition and make a remarkable place for itself in the marketplace. 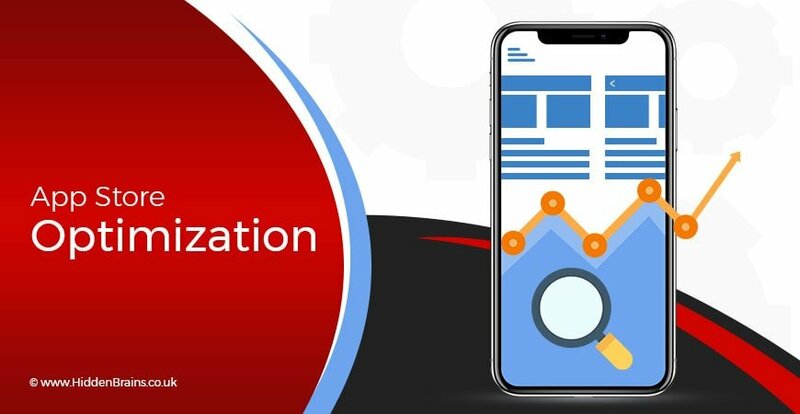 Also known as app search optimization or mobile app SEO, this process reshapes mobile apps to achieve a higher rank in the app store search results and top charts rankings. Simply put, ASO is quite similar to SEO where ‘keywords’ can make you win or lose the entire game. Finding for the right app store keywords is at the heart of ASO strategy. Which keywords are right for my app and what should be the ideal length of keywords? Make a list of all the keywords that you would like to use for app optimization. Keywords should be very specific and relevant to your app. Only when appropriate keywords are used in ASO, your app would be found by users who actually download and enjoy it. The next step is to optimize the selected keywords that perfectly describe the app. Keep the keyword’s length appropriate, ideally up to 100 characters for iOS apps whereas Google Play Store doesn’t specify any suitable length for keywords. The search engine of app store indexes user reviews. So review mining is a smart method for getting ideas of app store keywords. Another secret to searching for app store keywords is associating them with time sensitive and trending words. For example, a sports app launched before or during the Olympics game can greatly benefit by using the word ‘Rio’ in conjunction with its relevant keyword. It is recommended to choose the keywords with low difficulty and reasonable popularity for an early initial push of newly released app. These keywords can be later replaced by higher popularity and difficulty level to outweigh the competitors. After proper analysis and optimization of app store keywords, it’s time for putting the keywords in the right places. Where to place the app store keywords for optimum results? App Name: Nothing can be better than using the keywords as a part of your app name or title. Search algorithms of Google Play and iOS App Store scan the app name while any user runs the search query. These algorithms give higher priority to apps having main keyword in the title. But, you need to maintain a balance between branding and keyword stuffing as there is an upper limit for number of characters allowed in the app name – 30 characters for iOS apps and 50 characters for Android apps. App Subtitle: Apple App Store allows for adding subtitle to give a gist of your app. App subtitle is an opportunity for marketers to include main keyword within the character limit of 30. Even the subtitle is indexed by the search engine, so make the most of it. App Description: This is the game changer for Android apps as the algorithm for Google Play store searches for keywords in the description. Using primary keywords in the first few lines of the description can have a great impact in ranking your app higher in search results. However, app description in case of iOS apps is not indexed and hence does not carry more weightage in terms of ASO. App Promotional Text: This field comes before app description and is exclusive to Apple App Store only. Though not indexed in the app store search, this text with an upper limit of 170 characters can be used to sell your app idea to the audience for experiencing higher conversion rates. App Store Keyword Field: This metadata field is used to stuff all keywords that you would like your app to be discovered with. The key rule to use this field is make optimum use of all 100 characters with keywords separated by comma. The best way to utilize this field is not to repeat keywords and avoid using space, articles and prepositions. This field is available only for iOS App Store. URL: Using 1 or 2 keywords in the URL of app has proven results of improving the app search rankings. Do not waste this space as it can directly impact app store search listings. In-App Purchases: In-app purchases are indexed by search engines of Apple and Google. Use keywords in the names of in-app purchase, promotional image or description. Append keyword in the brand name by using a ‘small dash’ or ‘semicolon’. Some real examples of brand name appended with keyword in title are Amazon – Shopping Made Easy, eBay: Buy & Sell – Find Deals, Google Maps – GPS Navigation. Use short app description as the space to tell users why this app is unique and how it serves their purpose. Having a strong call-to-action in description text encourages visitors to install your app. The main goal of ASO is to increase the number of downloads and widen the user base. First two steps of app store optimization are focused on bringing users to your app page. Now the last step is to convince visitors to download the app and convert them into loyal users. What are the deciding factors for converting visitors to app users? App Icon: Use a simple, yet effective design for your app icon. It should leave a long lasting effect on the minds of people viewing it. The design of app icon should be such that it does not get affected even when scaled down to the smallest size required by App Store/Google Play. Screenshots of App Pages: Place the best screenshots that display the unique features or USP of your app at the beginning of an array of images. Use clean background in order to highlight text or caption. Screenshots should be effective enough to tell users why they should install this app. Preview Video: The preview video is an effective tool for promoting app’s features and functionalities. Use graphic-rich video to create an impact on viewer’s mind. Video should explain users how it solves their problem or ease their daily work. App Review and Ratings: Having positive user reviews on your app page marks a good impression to first time visitors. App reviews and ratings often become the deciding factor for visitors on whether it is useful to download and install the app or not. It is necessary to encourage satisfied users to write positive reviews and deflect negative reviews through ‘send feedback’ option. App Size: Users avoid installing apps that are too large in size. Smartphones come with limited storage and users have several apps installed in phone for different purpose. They prefer installing apps that are smaller in size and serve their purpose. Frequency of Updates: Releasing app updates frequently helps in resolving minor issues and implementing user’s suggestion much faster. Apple and Google encourage app updates as it contributes to improving in-app experience of users. Use a single object in the logo of functional app that describes its core functionality. Learn the science and psychological impact of colors and leverage it effectively for getting your app noticed through the logo. 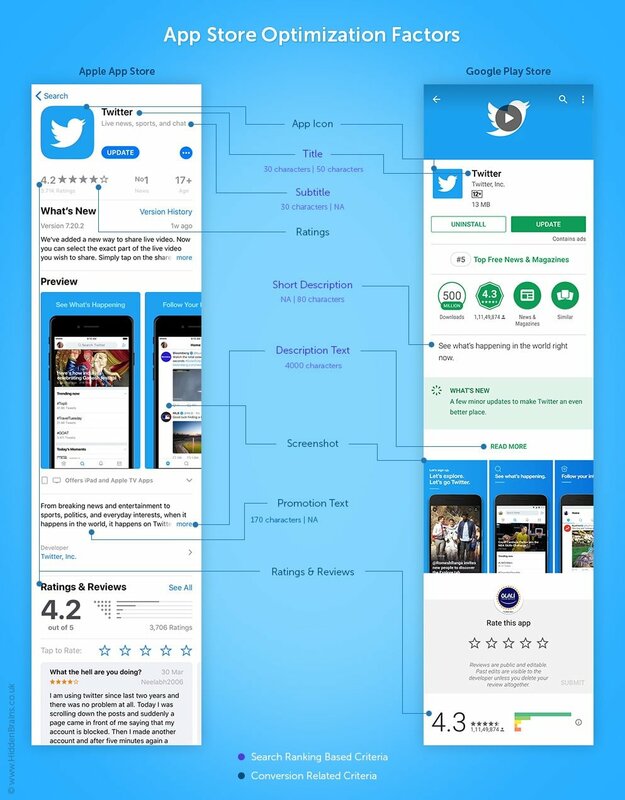 Another app store optimization marketing tip is to use vertical screenshots as they consume less space and allow users to view more number of screens at one go. Set the dimensions of screenshots precisely to ensure they appear properly on all devices. Resulting from a conflict of interest with Google Play Store policies, Amazon had no option but to rebrand its Android app. Amazon took this as a challenge to relaunch the shopping app and improve its ranking in the Play Store. The result was outstanding – Amazon app ranking surged from 300 to 1st place in less than two weeks. In order to understand how effective the techniques of keyword optimization and keyword placement are, compare the app’s performance before and after App Store Optimization. 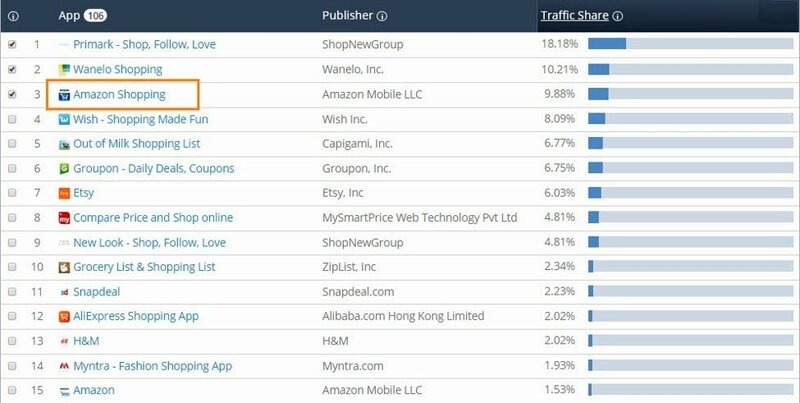 In the process of App Store Optimization, ‘Amazon’ brand name was coupled with a highly popular and competitive keyword ‘shopping’ to make a new name ‘Amazon Shopping’. This small but smart step doubled the overall effectiveness of keyword strategy. 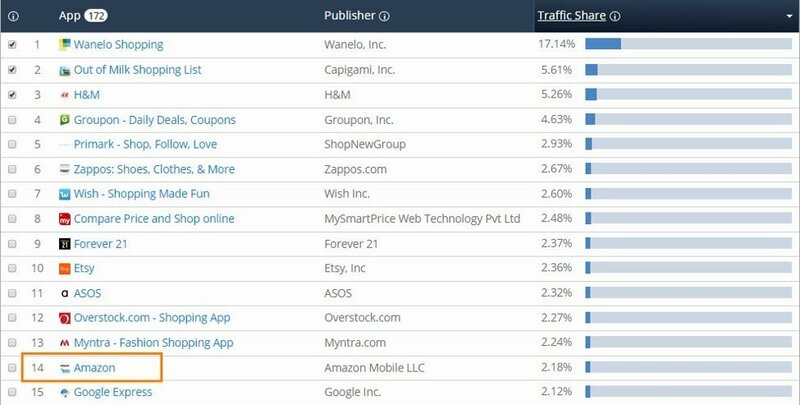 Prior to rebranding, Amazon app received 2.12% of the global traffic from the keyword ‘shopping’. Upon changing the name to ‘Amazon Shopping’, there was a drastic improvement in the global traffic coming from the ‘shopping’ keyword. The traffic jumped from 2.12% to directly 9.88%. popular apps including Amazon and Uber have achieved success in terms of high rankings in the Apple App Store and Google Play Store through strategic implementation of ASO methods. An optimized app generates more awareness among target audience and earns higher number of downloads. ASO is the key to mobile marketing strategy that will greatly increase conversions and ROI. Be At The Top, Be Visible. Click Here to Get an Optimized Enterprise Mobile App Right Away! Great goods from you, man. I’ve be aware your stuff previous to and you are just extremely excellent. I actually like what you’ve bought right here, really like what you are stating and the way in which wherein you assert it. You’re making it enjoyable and you continue to care for to stay it sensible. I cant wait to learn much more from you. That is actually a terrific website.